Carefully slice off the tops of the eggs with either a serrated-edge knife or a small pair of pointed scissors. Pour the eggs into a bowl, whisk and then add the cream. Mix, melt the butter in a sauté pan over medium heat, then add the egg mixture. Whisk constantly until lightly scrambled; the secret here to achieving a very small, moist curdle is to constantly whisk the eggs with a small rubber coated whisk to ensure the cooked eggs have the consistency of cottage cheese. Turn off the heat just as the eggs look almost cooked, to ensure they don’t dry out. Season to taste with salt – though none is needed for the egg with the smoked salmon topping. Clean the egg shells. Pour rock salt into three piles on the plate. Place the eggshells on the rock salt and press lightly – easy now – so they stand up, or place three individual eggcups on the platter. Carefully spoon the scrambled egg back into the shells. Wipe the outer shells with a wet towel as needed. 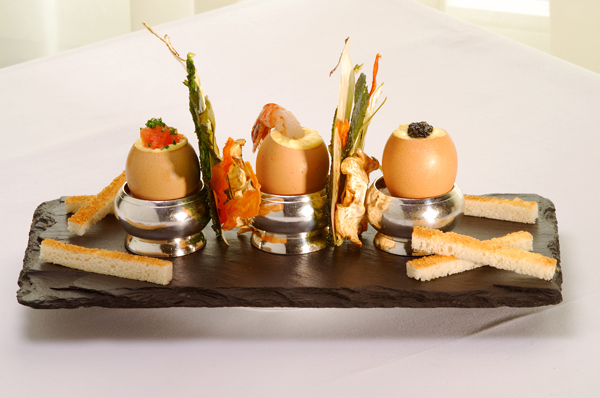 Then add a dollop of caviar to the top of one egg, smoked salmon strips to the second and potted shrimps to the last. Toast the bread and cut each slice into 3 fingers. Arrange these on a separate plate and serve immediately.